Although Japan has a reputation as being an extremely expensive place to travel there are thousands of free and low cost things to do whatever your interests are. In today’s post we look in on a kimono fashion parade, watch intricate silk weaving being demonstrated on traditional style looms and silk worms producing glistening thread – all for free in Kyoto. I stumbled upon the Nishijin Textile Centre when walking from Nijo Castle to Go’o Temple and the Imperial Palace. It’s in an unassuming part of town and I’m not really sure what made me think it was OK to wander inside but I did. I was pretty surprised not to mention super excited when I realised what I’d found. 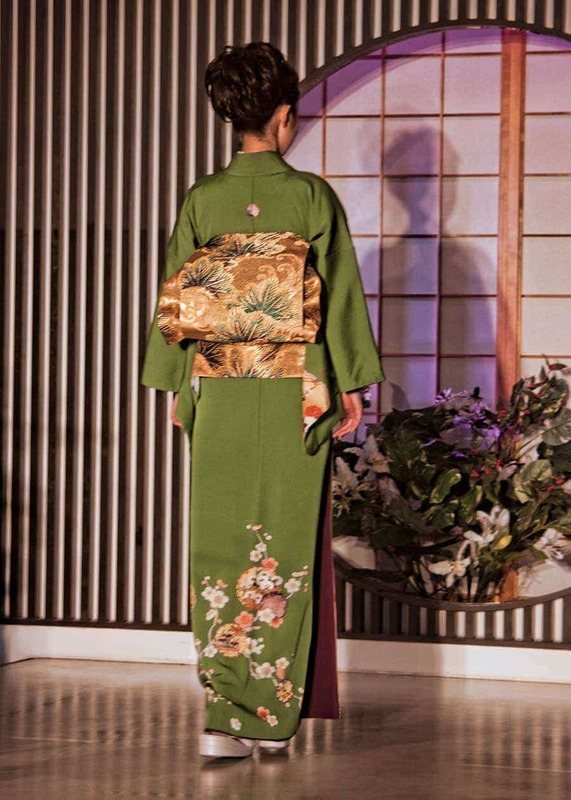 I’m a huge fan of Japanese culture and the kimono as you’ll know if you follow my Pinterest feed but even if you have a mild interest you’ll enjoy the parade and a quick look around. We arrived just as the parade was about to start and were ushered up to the edge of the runway where we had a great view. 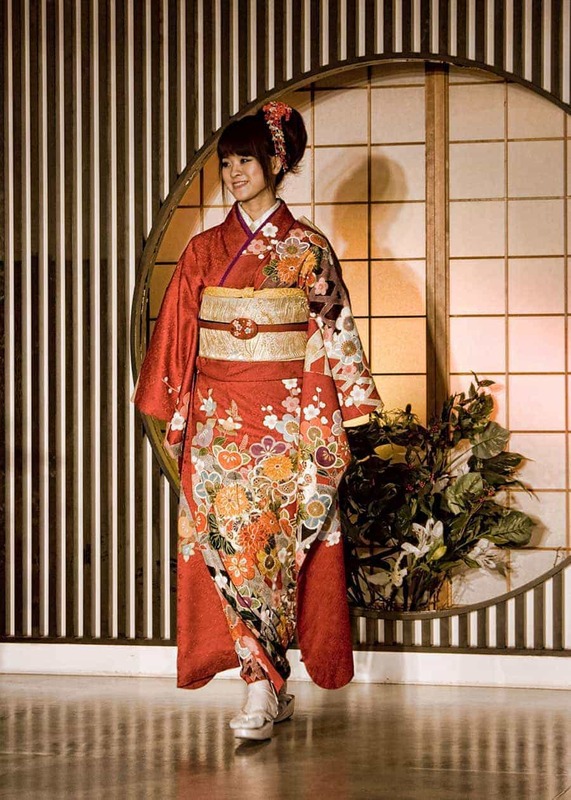 Models of various ages modeled different style’s of kimono suitable to their age and marital status. One even demonstrated on stage that it was possible to ride a bicycle in a kimono, I’m not sure how much demand there is for that but I guess it’s good to know? 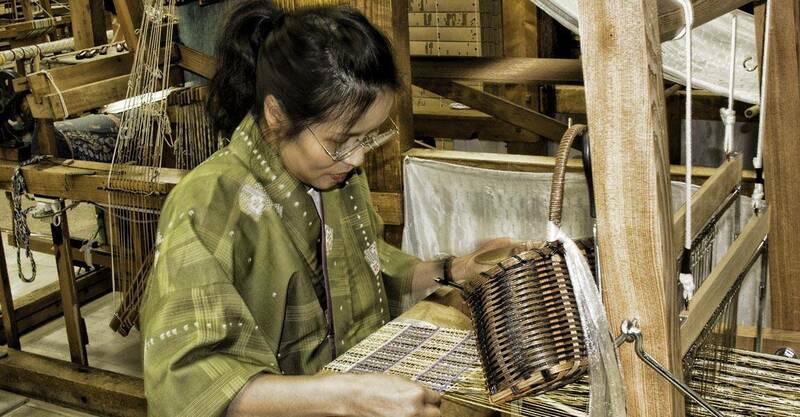 The Nishijin district has a long tradition with weaving. 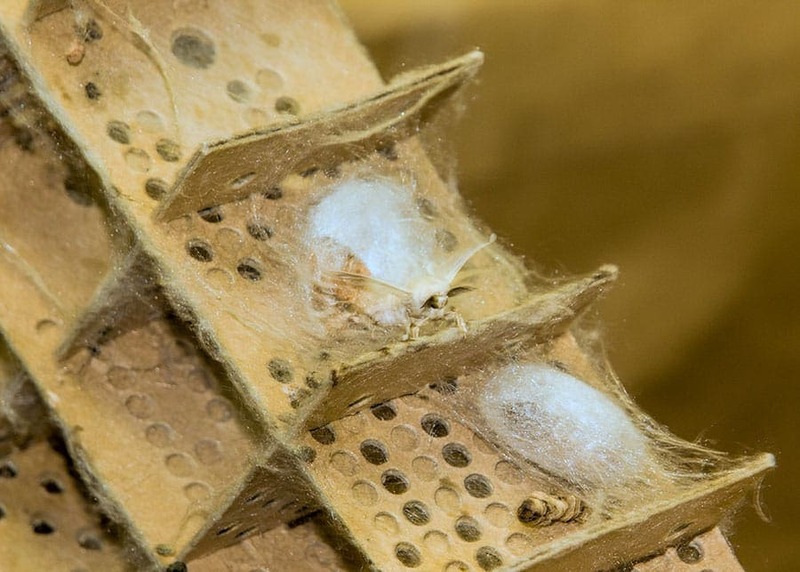 About 1500 years ago the Hata clan moved to an area in the west of Kyoto bringing with them their knowledge of silk worm farming and weaving traditions. When the Emperor moved the capital to Kyoto the Imperial Court weaving industry ensured its success. Later during the war textile production moved out of Kyoto or was taken over for producing essential twill cloth but was it was later re-established in the Nishijin area. On level 3 there are museum exhibits relating to this history. The venue is predominantly a silk souvenir shop but there was no pressure to buy anything. When the parade was finished we went upstairs where there was silk weaving being demonstrated on traditional looms and an example of the silkworm that generates the gorgeous shiny thread. I managed to communicate enough with the Japanese artisan on one of the looms to get her permission to take a photograph, her fingers were moving so fast as she created the patterned fabric that I wasn’t sure the image would be clear enough to use. 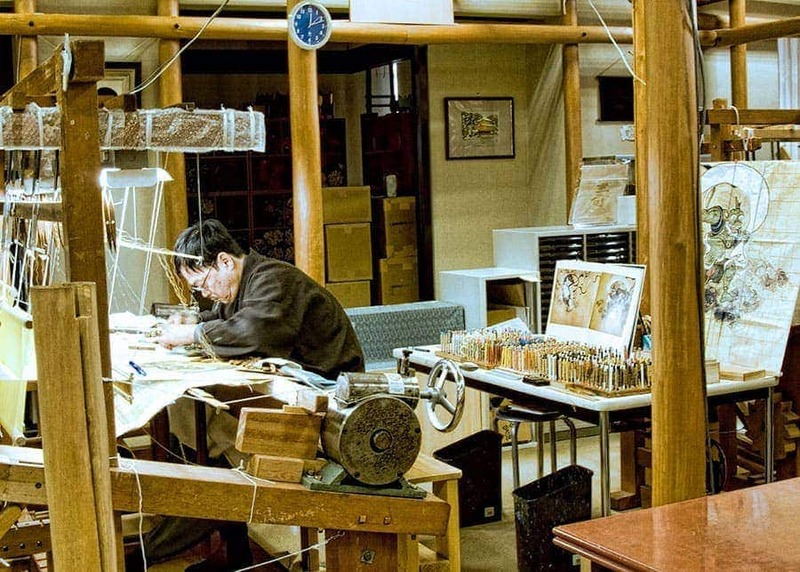 This male artist was creating the most intricate piece featuring the Japanese gods of wind and thunder. I’m really intrigued by the characters of Kaminari-sama and Raiden-sama so spent a while watching him working on it. There are other activities you can take part in for a fee such as trying on a kimono or weaving but we were just stopping by and had plans for the rest of the day. We also noticed that as we left two tour buses pulled up, I imagine if you went to a show when the tours were there it would be a bit crowded. Nishijin Textile Centre is a commercial entity and the parade is within that environment. I wouldn’t travel far out of my way to see the show but if you’re in the area around Nijo Castle or the Imperial Palace, and have an interest it’s well worth stopping by. The shows takes place each day between 10am and 4pm. There didn’t seem to be at a consistent time but were on at least once an hour so you won’t be waiting long. Is the Nishijin Textile Centre something you’d be interested in visiting in Kyoto? What a fun visit that must have been! I’m glad you also got a chance to take pictures of the artisans at the looms, and the kimonos are so beautiful! I’ve never been to Japan and probably never will, so it’s fun to read about far-away places on other blogs and travel virtually, at least. Thanks so much Jolanta, I also love to follow other travel bloggers both to find places to add to my constantly growing wish list and just to learn more about all the fascinating places in our world. Kyoto is a magical city. We spent a week there once just wandering through all the beautiful temples. If we ever go back I will be sure to visit the textile centre. Thank you for visiting my blog,Toni! Your blog is wonderful! It seems that you visited Nishijin Textile Centre,I’m happy to hear that. I have visited this facility several times,I saw that Kimono show,that was wonderful. Thank you for sharing such wonderful photos,they are very beautiful.